Growing up in the dark outskirts of the urban north east, Benjamin is bullied for his Orthodox Jewish faith. Taking to boxing as a means of self-defence, his choice alienates him from both his family and community as he becomes increasingly involved in dangerous, unlicensed fights. Years later, as the responsibilities of business, marriage and family overwhelm him, Benjamin is plunged into a bleak criminal underworld, forced to make a choice which devastates everything he has spent his life building. Desperate and searching for redemption he returns to the ring, uncovering a series of events which turn all he knows upside down once more. Orthodox demonstrates how; when all seems lost, resilience and faith inspire hope. It closes with “Maybe, just maybe, I’ve come home,” sung on the soundtrack, and going on to express the hope that God will take him as the boy he was, not the man he has become. We have seen Benjamin Levy, an Orthodox Jew, go through a great deal of heartache from childhood onwards, and it has taken its toll on his morals. Orthodox asks to what extent people of faith should merge with the dominant culture in which they find themselves. It ought, perhaps, to be a dilemma for all beliefs. Benjamin is bullied at school for looking different. In self-defence, he takes up boxing, which immediately of alienates him from the tradition in which he has been brought up. Almost disowned by his father, he is befriended by the gym owner Reg Shannon. Shannon is a crook who grooms Levy to do things that make him feel accepted by others. The trouble is that these are criminal acts. For a time, it seems as if the love of a good Gentile woman, Alice, and their two young sons will win out over his past; but worse is to come. After the death of his wife, Menashe (newcomer Menashe Lustig) is stuck in a difficult situation. Tradition dictates that he can’t raise a child without the help of a spouse, meaning his 10-year-old son is forced to live with family members until he remarries. He argues for an exception to be made and is granted a week to spend with his son alone, haphazardly performing parental tasks in an effort to prove to others that he’s worthy of more responsibility. There is a recurring image of pent-up greyhounds waiting for the traps to fly open and the race to start. It is an apt metaphor in regard to ourselves. When, in its full­ness, does life begin, and do we appreciate opportunities enough as they occur? Yes and no. Alice and the boys have been a gratefully acknowledged blessing. He has been invited to the ball, and, as if to demonstrate this, one of the film’s tenderest moments comes when husband and wife dance together in the kitchen. On the other hand, Goldberg, a powerful businessman in the Jewish com­munity, with blood on his hands, reminds Levy that, like Job, he has been dealt some bad cards, but he has made bad choices. Levy can see it for himself in Daniel, a young Jew drifting in much the same way into Shannon’s clutches. It spurs Levy into rescue and self-renewal. The film offers the results of upbringings both religious and secular, producing flawed but normal human beings, Jewish or otherwise. It is not so much that faith doesn’t make any difference to people’s behaviour as a strong sense of people failing to do the good they wish to. The faith-values of those who went before us keep tugging at our sleeve, even if our nurturing wasn’t all that it could have been. Ultimately, Orthodox beckons its characters towards an under­standing of Fatherhood which transcends our earthly existence ­that even when we are still far off, there’s One who yearns to greet and bring us home, who re-members (the hyphen’s deliberate) the child we were, no matter how tarnished we may have become. The Guardian said. ‘It’s absurd material, very obviously overstretched, beyond breaking point, from its origins as a short’. 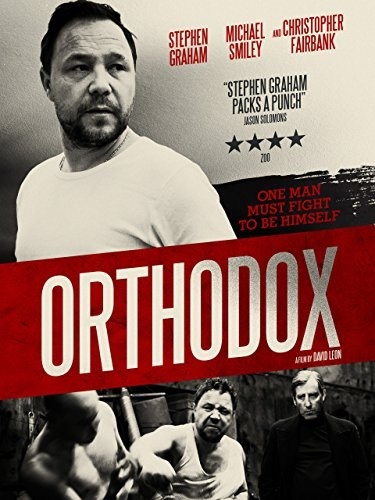 Shot in and around Newcastle, Orthodox does offer a persuasively gloomy vision of urban decay in an England that feels both old and modern. The exploitation of anonymous foreign workers by Shannon feels entirely topical but Benjamin’s struggle against the forces of evil and his own conscience seems to belong to the shadowy world of post-War film noir or golden age 1950s television dramas.